Crysis: "Woody, You Were Right"
At E3 2006, I stood and ogled Crysis as it blasted across the monster screens in the EA booth. Well, the game was released the middle of last month and chatter about the game has been significant. But, I've noticed a pretty common thread that runs though the reviews. Even the most smoking PCs have to have their settings turned down to handle the game. In the review I read last night, the reviewer said "It's doubtful that a system has been built yet that can run the game at ultra-high resolutions with all the graphical sliders maxed out." 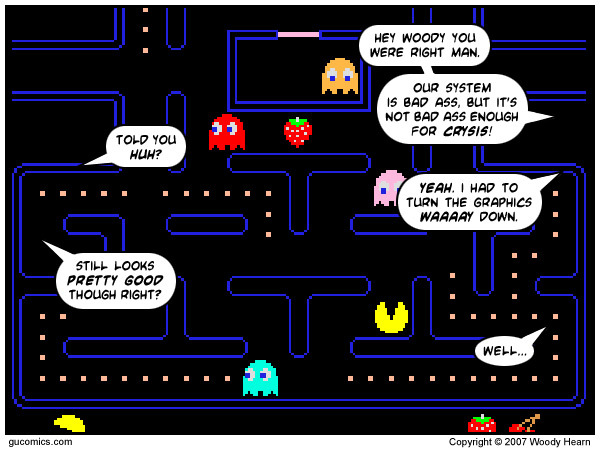 Okay so the game is NEVER going to look like PacMan no matter how far you turn it down. And the notion that gameplay would also suffer is a complete fabrication. But, I couldn't help but to be amused, as an old school gamer, by the idea that someone might have to turn down the settings so far that Crysis would essentially revert back to an Arcade Classic. Initially the intent was to use a screenshot of the original Metal Gear. But, I decided I needed to use a game that was a bit more identifiable.